Messages that have to do with my LegalShield (formerly Pre-Paid Legal) business. Rip Mason, the CEO of LegalShield, is quoted more than once in this article, and with LegalShield’s new Premium Identity Theft Protection service, he ought to know. The first message in this blog for September will be a follow-up on my message from last Friday. First of all, the new UK football coach, Mark Stoops, had an embarrassing debut when UK lost to Western Kentucky last night. Can you say Big Blue Frustration? Weather-wise, we got five inches of rain for the whole month, and two of those inches fell on the last day. Thank goodness it wasn’t all at once; there were at least three showers at my house, as wave after wave of rain clouds passed over from the northwest. And there weren’t any leaks in the house this time; that’s the best news. There doesn’t seem to be much point in a holiday for celebrating work when you don’t have a job. Because of that I don’t plan to shop or otherwise goof off for Labor Day; I expect to be quite busy, though my schedule isn’t complete yet (I’ll mow the lawn if the grass is dry enough). Leive’s niece Rezia came over, picked up Leive, and took her out to lunch. That was awfully nice, but after they came back, they sat in the family room and talked for a couple of hours (in Cebuano, no doubt). Did they have to do that where the family parrot, Brin-Brin, could see them? Brin-Brin doesn’t like Rezia, because she married his worst enemy, and though she wouldn’t hurt a flea, whenever she comes to the house she makes Brin-Brin cry! What a silly bird . . . In the evening we went to visit my Dad, and ended up spending two hours at the retirement home, so Leive could give him a shave, haircut and manicure. Definitely a job well done, to make up for the times I go there alone. Finally, last month’s LegalShield promotion has been extended into September. Normally it costs $149 to become a LegalShield Associate, but for a limited time, those who sign up can qualify for a $60 rebate if they make a sale this month. What a deal, you’ll come out ahead almost immediately! If you’re interested in knowing more, contact me for the details. Are you looking to make more money this year? Mike Humes, one of the most successful Legalshield Associates, is coming to speak in Lexington on Monday evening, at the Embassy Suites on Newtown Pike. When he got started in the business, he was an ordinary mailman; now he is a millionaire, and three years ago Ebony Magazine did a story on him, as one of the top entrepreneurs of 2010. I like to say he "went postal" in a good way. If you are interested in seeing him, contact me for the details, and you won’t have to pay to attend the business briefing. Well, Leive is out of the house. She left at 4 PM with the ladies of our church to go on a retreat in the nearest Kentucky mountains, 46 miles southeast of here. They went again to Aldersgate, the same campground Leive and I had been to before; see my message from May 30, 2010 for the pictures I took when I was at Aldersgate. They will return on Saturday afternoon, so here in the house it is just Brin-Brin the parrot and myself for roughly 48 hours. I joked before they left that I expected my biggest problem would be getting along with Brin-Brin. He still prefers Leive’s company over mine, to the point that I have nicknamed him “Snapping Pigeon” and “the Original Angry Bird.” Fortunately he did not shred the newspaper today, though I expected him to when I took out the garbage without his permission. As it stands, I had a bigger challenge this evening. At 6 PM I went out to run a couple of errands and look for prospects for my LegalShield business. I had the Buick blocking the garage door (the van of one of the church ladies is currently parked where I normally park the Buick), so I took the Buick on this run, instead of the Nissan, though the Nissan is definitely in better condition. It stalled twice on the way out, before the engine warmed up –- I’m used to that behavior, alas. Then it ran all right for most of the trip, until I came back. About four tenths of a mile from home, the engine quit again, and this time I could not get it started again. If this was Florida, I would have tried pushing it the rest of the way home, because Florida is flat. As is, I had to go up a hill to get home from here. Fortunately I still had my AAA membership from my adventure in Connecticut (see my message from September 27, 2011). I used that to call a tow truck, and they arrived an hour later to take the Buick and I home. We left it on the curb by the mailbox, instead of in the driveway; I’ll wait until after the ladies come back before deciding what to do about the broken-down car. One thing’s for sure, when I can afford to replace one of the cars, the Buick will be replaced first. I picked up some sweat, dust and mosquito bites while waiting for the tow truck, so after getting back I took a shower. Now I’m having a very late dinner; hopefully tomorrow won’t be quite as interesting. I’m back at last. From July 3 to 7 Leive & I were in Georgia, visiting our daughter Lindy, her husband Adam and our granddaughter Lexi. This was the first time we had seen them in two years. I also actively promoted my LegalShield Business while I was down there, so this was a business trip as well as a pleasure one. To avoid wear and tear on our own aging cars, I rented a Chevy Impala. It handled well, but the weather was against us for most of the way down. Both Kentucky and Georgia are having a very wet summer (last week alone, Kentucky got nearly as much rain as it normally gets for all of July), and it rained from the Kentucky-Tennessee border to Dublin, GA, a distance of about 410 miles. Before it was over I joked about driving in a hurricane; the weather and traffic jams (in southern Tennessee and Atlanta) caused us to arrive quite late, long after Lexi had gone to bed. Lexi is now three years old, so I doubt if she remembers our last visit. For our second day we drove to Savannah to buy her some presents, and I brought some more from Kentucky, so she probably thinks the Fourth of July is another Christmas. Here she is in Savannah’s Ross store with Leive. The next day (Friday) was Leive’s birthday. Because of the on-and-off rain, we stayed home for most of the morning and afternoon, but in the evening we all went to Leive’s favorite Chinese restaurant in the neighborhood, to celebrate. 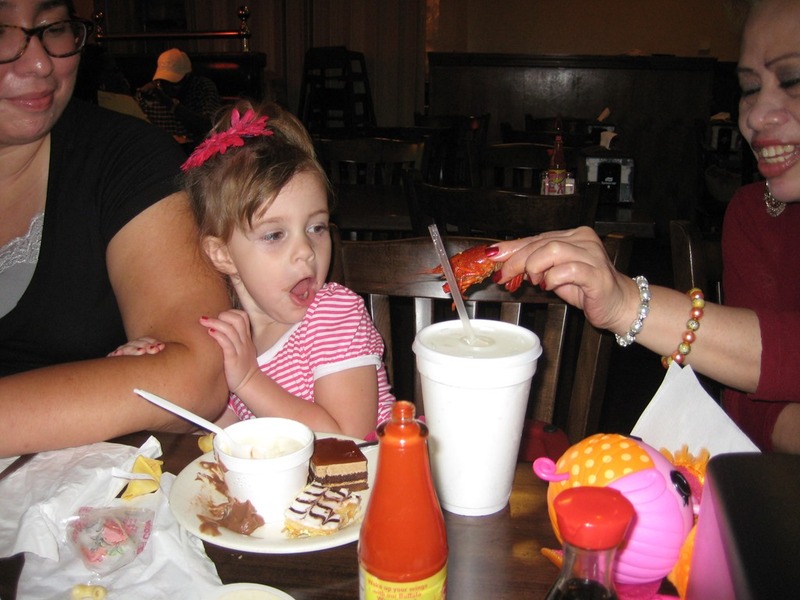 They had a special menu, so Leive gave Lexi a scare with a crawfish! 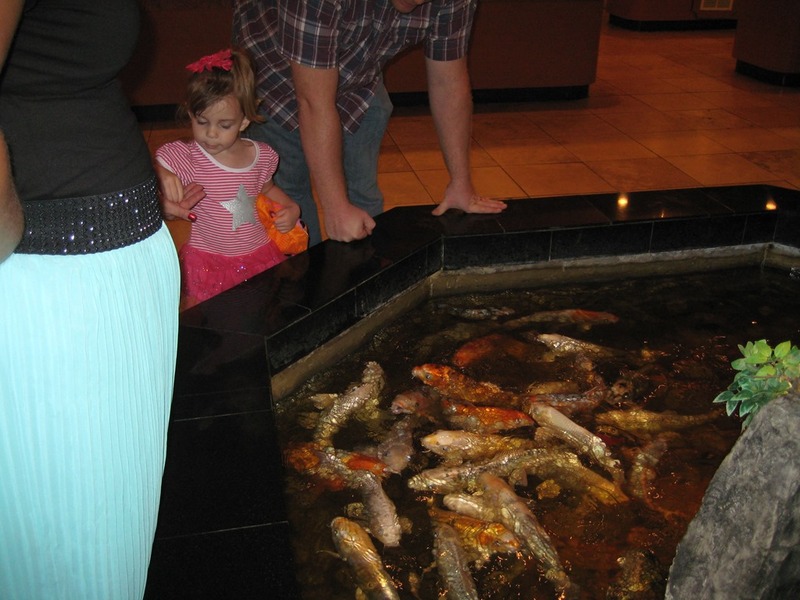 And Lexi got quite a reaction when she fed the fish in the restaurant fish pond. On Saturday, I was out aggressively distributing LegalShield business cards and brochures. This interesting antique shop was closed, though. 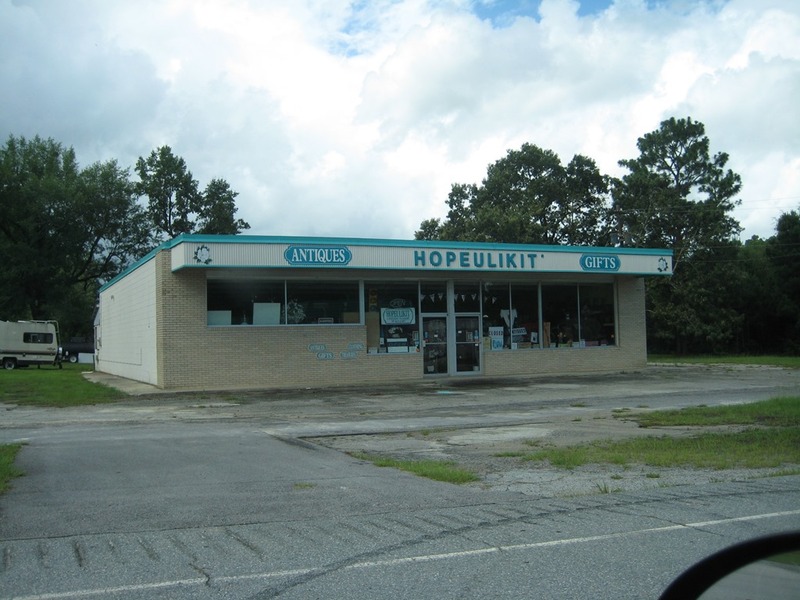 Supposedly “Hopeulikit” is also the name of that neighborhood. 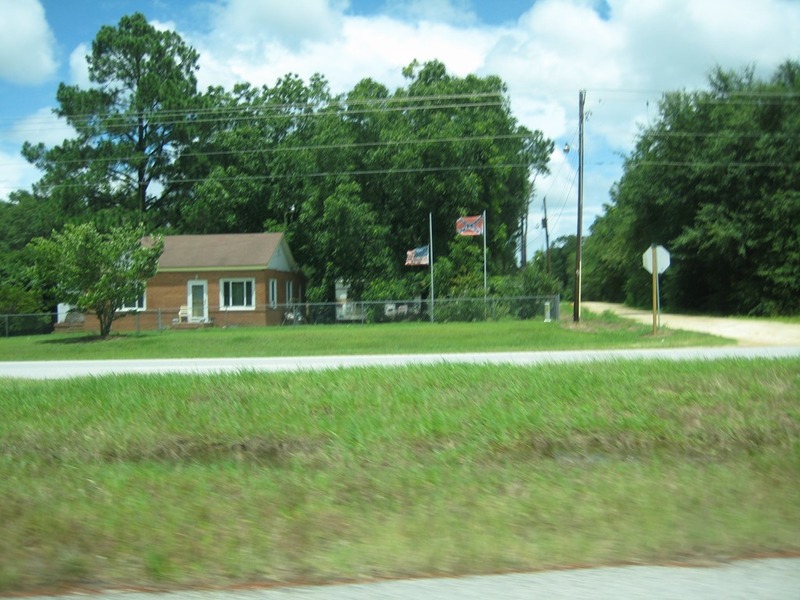 Nearby I noticed a house where the American flag was at half-mast while the Confederate flag flew twice as high. For many Georgians the Civil War never really ended. 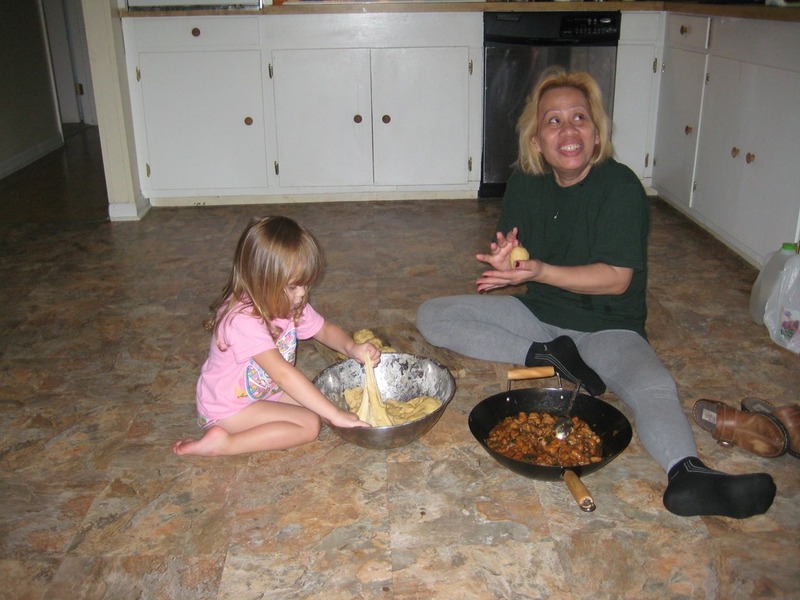 Meanwhile at home, Lexi helped Leive make the dough for sio pao (steamed rolls with a meat filling). 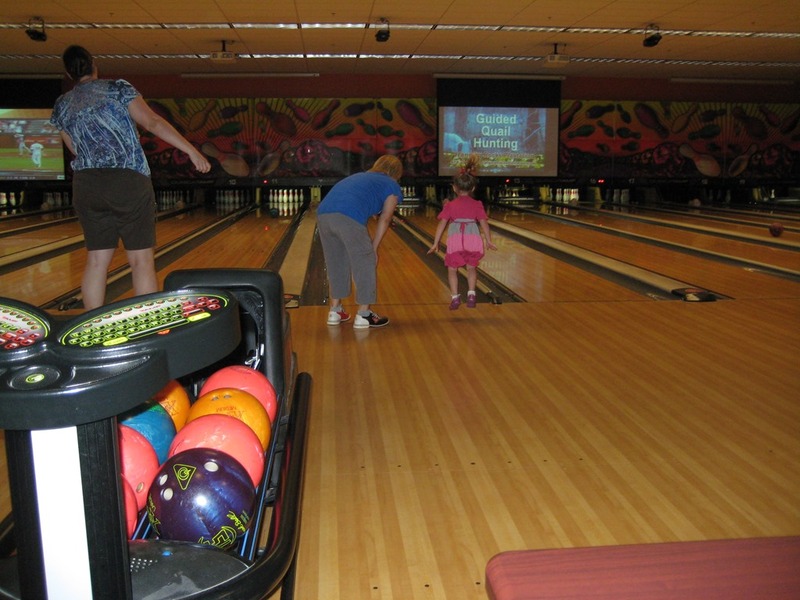 That evening we went to a popular clubhouse, and played a game of bowling. Here Lexi jumped when she saw Leive bowl a good ball. Later she helped out when Lindy’s ball got stuck in the gutter, and she went out on the lane to roll the ball back to me. I’m sure I would have slipped if I had gone there, because the lanes are greased. After the game, Lexi and Lindy played in the clubhouse ball pit until it was time to go home. Sunday was the day of our trip home. We got rain from Macon onward, so I wished out loud that it would finish by the time we got to Knoxville. On previous trips I learned to dislike the 60-mile drive between Knoxville and the Kentucky border, because the mountains and the elevation make that stretch a challenge, especially when the weather is bad. Well, it did clear up in Knoxville, so northern Tennessee wasn’t so bad this time; I even got through it before the sun went down. As we entered Kentucky, it looked like the worst part of the trip was behind us. Traffic is moving again on I-75 in Madison County after a crash forced northbound lanes near Berea to close down. Around 8 on Sunday night near mile marker 78, a semi was rear ended by another semi. The second truck was hauling hydrated alumina, a non-hazardous chemical that spilled into all three northbound lanes. Crews finished cleaning up the wreck early Monday morning. The cops detoured us to a side road at the Berea exit, which we took to Highway 25, and followed that to Richmond, where we could use I-75 again. In the end we got home at 1:20 AM, four hours later than expected. I couldn’t sleep late, though, because I had to return the rental car. By tomorrow we should be completely recovered from the trip, and will get back into the routine of home life. I have had an Internet presence for nearly sixteen years; in Internet time that is more than a century, right? In the course of that period I have had several favorite browsers: WebTV (1997-99), Internet Explorer (1998-2004), Firefox (2004-08), Google Chrome (2008-10), Opera (six months in 2010), and Google Chrome again (2010-13). I also have Avant and Safari installed on my laptop, though I have never used them much. Now I have switched back to Opera. What happened is that a week ago, a gentleman picked up one of my LegalShield business cards and said he definitely needed our services. However, we couldn’t get all the information we needed to sign him up when we met in person. By the time I got the rest of the info, it was the weekend, so we decided to sign him up online, instead of with a paper application. This was the first time I had tried an online application, since LegalShield Associates got new business websites last April. Each time I filled out two pages of electronic forms and hit the “submit” button, I got an error message. I did this four times, using my then-favorite browser, Chrome. Then on a hunch, I tried filling out the forms using Opera, and that went through on the first try. I know, Opera is not the most popular browser around; some of you probably aren’t familiar with it. According to Wikipedia, about 2 percent of the folks in cyberspace use Opera, and the only country where it has more than 50 percent of the users is Belarus. Yes, the same Belarus where a fisherman was recently killed by a beaver; the former White Russian republic is starting to look like the strangest country in eastern Europe. Still, even when another browser was my favorite, I kept Opera handy, because these days, it is the only browser which handles MHT files properly. The most unusual part of the story came when I called LegalShield to tell them about my online experience, and verify that they got the application. They said that because Chrome consumes too many system resources, their websites are designed to work with every browser except Chrome. I wish I had known that sooner. I spent Sunday afternoon switching the default browser on my laptop from Chrome to Opera, synchronizing the bookmarks, and downloading Opera onto my tablet. Still, leaving Chrome seems like the end of an era. I have always liked Google software, and a year or two ago, I persuaded Leive to switch browsers, from Internet Explorer to Chrome. In fact, the Google software was one reason why I picked a Google tablet last January; because I was already familiar with the programs, it was easy to learn how to use the tablet. And last week Leive and I were amused, when we saw the Google Earth truck drive through our part of Lexington. But I am planning to sign up a lot more people as LegalShield Members and Associates, so Chrome will have to go. Oh well, let’s see if my second period with Opera as my default browser lasts longer than the first.